Vše o EU štítcích pneumatik – co Vám řeknou? All tires sold in the European Union are subject to mandatory tire labeling. The EU Tire Label provides clear information on the environmental and safety characteristics of a tire based on three central criteria; fuel efficiency, wet braking, and noise levels. Understanding these symbols on the tire label help drivers to make critical decisions about greater road safety, reduced pollution, and increased fuel economy. Your tires rotate as you drive down a road, flexing towards and away from the surface of the road; this leads to a loss of energy. The amount of energy lost correlates with the rolling resistance of the tire. Tires that have a low rolling resistance are the most energy efficient. That means less power – and therefore less fuel – is required to move the vehicle. Since tires can account for between 20% to 30% of a vehicle’s fuel consumption, choosing new tires that are energy efficient will result in direct fuel cost savings. The tire labeling features easy-to-understand pictograms that provide information on the following three essential aspects of a tire’s performance. Critical for driving safety is a secure grip in wet conditions. The wet grip rating indicates how well the tire will perform in wet conditions, with performance graded between class A and class G (although D and G are not currently in use). In general, the EU label assumes a speed of 80 km/h. Braking at this speed, a class A tire will come to a stop in wet conditions after 28 meters. By comparison, a class F tire requires 46.5 meters to come to a stop, giving a difference of more than 18 meters. From a safety point of view, it makes sense to opt for a higher-class tire. Depending on the tire’s rolling resistance, its fuel efficiency will range from class A (denoting the best fuel economy) all the way through to class G (delivering the worst fuel economy). Between classes, fuel consumption increases by approximately 0.1 liter for every 100 km driven. Noise level is the external rolling noise generated by the tire, measured in decibels. The number of filled sound waves on the label equates to the noise level of the tires. 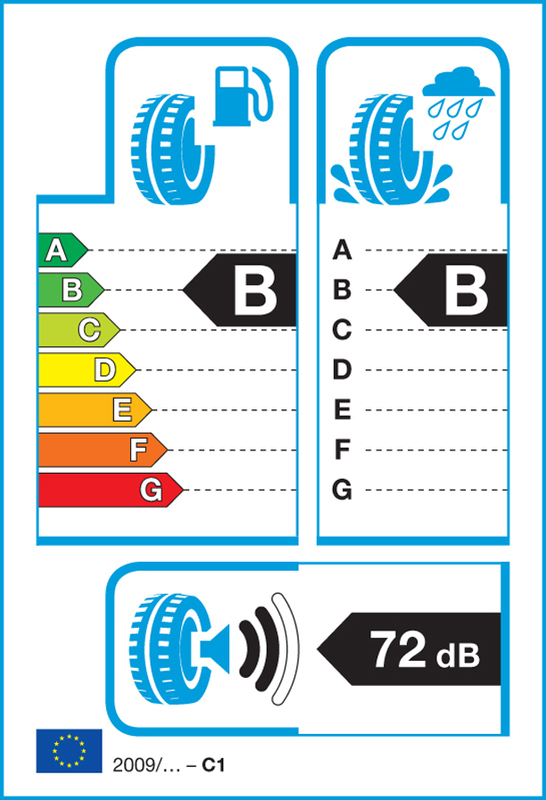 A single sound wave means that the tire has the lowest noise level, between 67 and 71 dB. The highest level is represented by three sound waves, which is between 72 and 76 dB. Choosing energy-efficient tires will lower your fuel costs. For example, switching from class G tires to class A tires can improve fuel consumption by as much as 9 percent. Let’s imagine that your car has a fuel consumption rate of 8 liters per 100 km, and you cover 65,000 km on one set of tires from new. Using class A tires amounts to a fuel saving of up to 440 liters over their lifetime. If the fuel price is €1.50 per liter, you could potentially save up to €660 over the lifetime of the tires. Just keep in mind that the additional purchasing costs of energy-efficient tires may be outweighed by the fuel cost savings, resulting in total overall savings over time. Extra weight increases fuel consumption; regularly clear out any non-essential items from the car. Continental welcomes the introduction of the European Tire Label and the improvement of tire information for consumers at the point of sale. Since its introduction in November 2012, the label has raised consumer awareness of the fuel efficiency, safety properties, and noise levels of new tires. Between each class, the difference in fuel consumption for every 100 km driven will vary by around 0.1 liter, and the braking distance required on a wet road at 80 kph will increase or decrease by up to 6 meters. Tire tests conducted by car magazines will continue to be an essential source of information for motorists, because they test up to 11 product properties in addition to the three criteria shown on the label that are relevant to safety. Tire performance criteria that are essential in winter, for example, aren’t present on the label. We would urge consumers to consult alternative published sources – such as tire tests, retailer advice, manufacturer materials, etc. – when purchasing winter tires. For further information on the EU Tire Label, visit the official EU Commission website.